James R: 2017 may be drawing to a close, but this week's releases show no sign of an end-of-year slowdown. 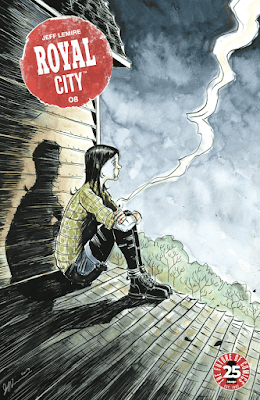 First and foremost for me (naturally) is the magnificent Royal City. Jeff Lemire's magical creator-owned series is still weaving its way through the 1990s for the Pike family, and this will be the book that I read first - I simply can't get enough of this title. From BOOM! Studios, there's a continuing favourite and something new to try. Firstly, there's the next issue of Matt Kindt and Tyler Jenkins' hugely inventive thriller Grass Kings, and then there's Judas from Jeff Loveness. We flagged this one up earlier in the year whilst looking through Previews, and I'm excited to see what Loveness and artist Jakub Rebelka do with the story of the New Testament's infamous traitor. DC comics has one stand-out title for me this week; the next chapter of the magnificent Mister Miracle from King and Gerads. There's already been a huge amount written about this title (and a lot by us!) but it's safe to say that this is a must-read for any comics fan of taste. Finally, there's two other books from Image on my list: the third issue of Slots, the crime caper from Dan Panosian, which has reminded me more of Elmore Leonard with each page (this is a very good thing), and the finale of Retcon from Matt Nixon and Toby Cypress - definitely the most out-there title on my list, and I'm looking forward to seeing if the timeline-resetting tale ties up nicely. A rather tasty December week in prospect then - I hope your pull-lists are looking just as appealing, and whatever you're geeking out over - happy reading! Matt C: Mister Miracle is my top pick of the week, again. I shouldn't be as surprised by this title as I am considering Tom King's sterling work with a Marvel B-lister in The Vision along with the previous King/Gerads team-up, the searing Sheriff Of Babylon, but every issue so far has been a jaw-dropper. We're only up to the end of the first act but it seems, unbelievably, like the best may be yet to come. Other titles of note include Royal City #8 and Damned #6, but if I'm being honest I think the geek side of my brain may be taken over with thoughts of a certain movie released this week. You know the one (at least, I hope you do!). It's a big deal, so forgive my relative lack of enthusing over this week's releases. The balance will be restored shortly!